Home » How to Make Digital Copy Work on HP TouchPad? How to Make Digital Copy Work on HP TouchPad? From above we can know that it is impossible to directly play digital copy movie on HP TouchPad, since all of the digital copy files have protection code to limit the copying to other devices for playing. But we can use a powerful digital copy to HP TouchPad converter on Mac to convert digital copy to HP TouchPad compatible video on Mac. Here you are recommended to use Pavtube ChewTune for Mac to make it. It is a really digital copy to HP TouchPad converter on Mac which helps you convert digital copy to HP TouchPad on Mac and enables you play digital copy movie on HP TouchPad. Follow below steps, you will find how to make Digital DVD Copy work on HP Touchpad. Step 1: Transfer your digital copy files to your Mac. Connect an external Blu-ray/DVD drive to Mac, and put the digital copy disc to it. Then you need to choose to transfer digital copy movies to your iTunes with the protection code on the cover of your disc. Step 2: Import digital copy files to Pavtube ChewTune. 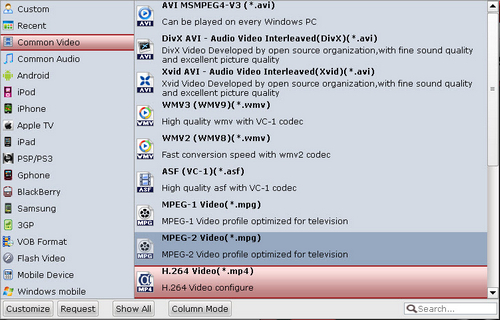 Run Pavtube digital copy to HP TouchPad converter on Mac, and click the add button to import the digital copy movie to the program. Step 3: Choose output format for digital copy to HP TouchPad conversion. To transcode digital copy to HP TouchPad, you are recommended to click the format bar and choose Common Video >> H.264 Video (*.mp4). Click the settings button and change the profile settings for HP TouchPad. Below settings are recommended for you. Step 4: Convert digital copy to HP TouchPad MP4 video on Mac. Click the convert button and then the digital copy to HP TouchPad conversion on Mac will start at once. After that, you can transfer the converted MP4 video to HP TouchPad for playing.